Welcome to Hybrid Hollow Production. I am an avid animal lover, especially Donkeys and Mules, hence the name Hybrid Hollow. Having grown up near St. Louis but spending a few summers on my Grandparents' farm, I knew by the age of ten that I would someday have a farm of my own. Around this time, I was also given my first camera, a little Kodak 110. I started out by documenting my summers on the farm, fishing, gardening and riding bikes with my brother. I captured moments of my life, that as an adult, I now treasure very much. These early images helped nurture my passion for documenting life as it happens with the use of my camera. Somewhere along life’s journey to become a farmer, a passion for photography evolved. This allows me to capture the little things that give me pause and bring me joy. I would say that my Mom helped create my eye for photography in as much as she had me pay for my own film out of my allowance. I learned very quickly to eye up my subject before snapping any photos. Although my photos are not complex, I hope anyone, no matter where they may live, will be able to feel a connectedness to the land and a simpler way of life. At the age of twenty five, I was able to plant my roots on a small piece of land in the middle of Missouri. 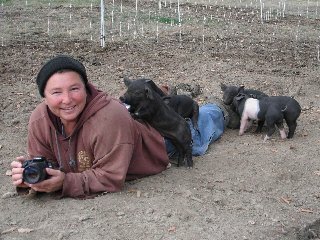 Since then, I have raised an assortment of critters and have become very involved with my local farmers' market, food circle group and other small farmers who care deeply for the land, the animals they raise and our future generations. It is with my camera that I now try to celebrate and preserve life in and around small farms that help make up the backbone of sustainable agriculture as we know it today. Born a city girl, I am very thankful to have a degree in Animal Science but truthfully, most of my farming education has come from rolling up my sleeves and getting my hands dirty. I share my little slice of happiness with a small herd of Irish Dexter cattle, a few Katahdin crossed sheep, a couple pygmy goats and Red Bourbon turkeys, not to mention numerous guineas, ducks and countless free-range chickens. Of course like any farm, mine wouldn't be complete without my dogs and cats that keep me company as I go about with my farm chores. And last, let's not forget my two donkeys, David Cicero and Clela D. Donkey who were named after my Grandparents. And finally, there is my mule, Davy Crockett, who I have proclaimed to be King of the Missouri Mules! My style of photography is very laid back and down to earth. I don't shoot with any fancy equipment, but what I have seems to work. My photography reflects my everyday existence and the simple pleasures that surround it. For anyone who can appreciate the simple life, I try to capture the little things that give pause and bring you joy. Roll your sleeves up, kick your shoes off, grab a glass of lemonade and enjoy. Friends are always welcome. Hybrid Hollow Production, Photography by Kim Carr, notecards! She especially loves the collection of feline cards.